A factor that is a prime number. One of the prime numbers that, when multiplied, give the original number. Example: The prime factors of 15 are 3 and 5 (3×5=15, and 3 and 5 are prime numbers). "Prime Factorization" is finding which prime numbers multiply together to make the original number. Yes, it divided evenly by 2. We have taken the first step! As you can see, every factor is a prime number, so the answer must be right. A number written with the bottom part (the denominator) telling you how many parts the whole is divided into, and the top part (the numerator) telling how many you have. The numerator is the top number of a fraction. This is the number of parts in a whole. This is the number that represents the number of equal parts of a whole. The multiples of a number are what you get when you multiply it by other numbers (such as if you multiply it by 1,2,3,4,5, etc). Just like the multiplication table. When you list the multiples of two (or more) numbers, and find the same value in both lists, then that is a common multiple of those numbers. Notice that 20 and 40 appear in both lists? What is the Least Common Multiple? It is simply the smallest of the common multiples. ... so the Least Common Multiple of 4 and 5 is 20. How do I find the Least Common Multiple? It is a really easy thing to do. Just start listing the multiples of the numbers until you get a match. The greatest common factor of two or more numbers. The smallest common multiple of two or more numbers that is not 0. We are going to learn about fractions today. A common fraction is part of a whole expressed as a numerator over a denominator. 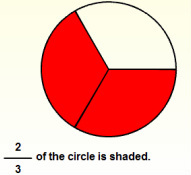 Fractions are easy to identify when we can see them. Equivalent expressions have the same value.